Graduated from: I was a music major at Golden West College in Huntington Beach, Calif. I practiced the trumpet eight hours a day. It was only a two-year college, but I got sidetracked and never went further. 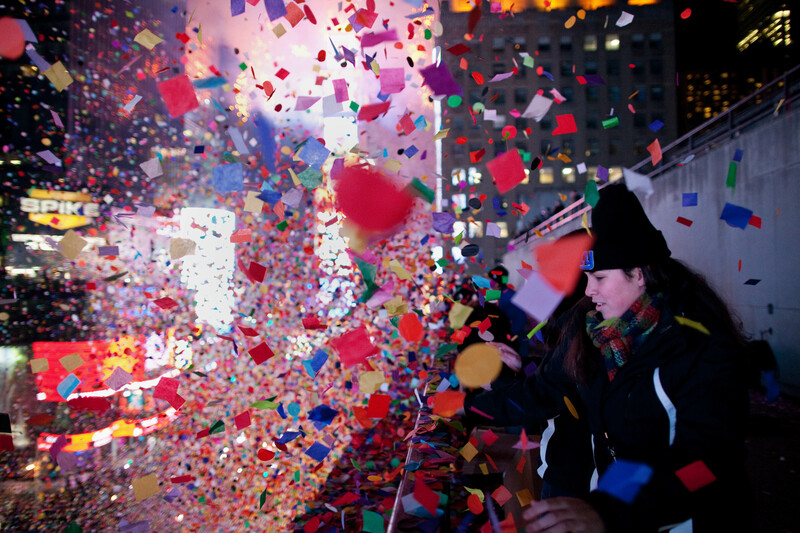 Years in the business: I’ve been coordinating the confetti on New Year’s Eve in Times Square for 22 years straight. Previous jobs: In college, I worked at Disneyland tying and selling balloons. I could tie 1,000 an hour by myself. Then, after college, I hooked up with a guy named Wally Amos, of Famous Amos Cookies, and worked for his cookie store on Sunset Boulevard as a cashier. Later, at his warehouse, made 3,000 pounds of handmade cookies a day, and they were to die for. While working for Wally, I met a guy named Dave Klein, the man who had just invented Jelly Belly jellybeans. He encouraged me to start my own balloon art business, and lent me some money to do so. Now, I do the balloons for the Academy Awards, Super Bowl, and presidential conventions for both Republicans and Democrats. In the first few years of my balloon business, we were grossing millions annually. I hold Guinness world records for balloon art, too. Which led to confetti how, exactly? I had worked with Peter Kohlmann, a vice president of the Times Square Business Improvement District, for previous events in New York. So when the committee was looking to transform New Year’s Eve in Times Square to something more than just a huge gaggle of drunk and unruly people, Peter called me in. The goal was to add effects to make the event more family-friendly, so I suggested starting with confetti. So we did it, starting in 1991, and it was a huge success; I learned how from a gentleman at Disneyland. That was back in the day when they lowered the ball by hand, on a flagpole. So my main business is still balloons, but this my consistent New Year’s Eve gig. 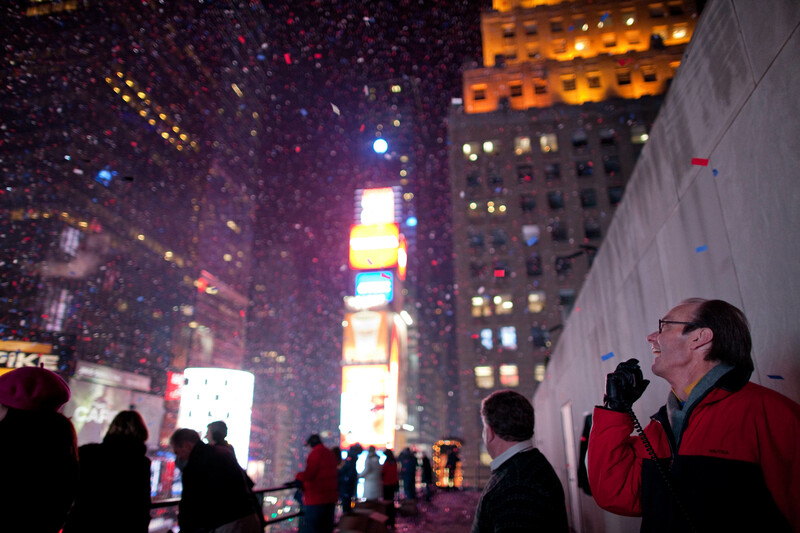 In Times Square, a hub of all the latest LED screens, the New Year’s Eve confetti process is very rudimentary by comparison. Pounds of confetti used: 3,000. There’s some additional for special Spider-Man effects this year; sponsorship for the event is always a struggle. Just before 11 p.m. this year, as the movie trailer plays, white streamers will descend from all sides, like a spiderweb. Confetti made from: Biodegradable paper. I’d like to get to the point where it’s 100% recyclable. Do you use cannons to shower the crowd in confetti? We did – and still do – everything by hand. We stand on setbacks on the upper floors of eight different buildings in the center of Times Square and disperse the confetti. I prefer “disperse” to “throw.” It’s very safe, with railings. Although you do have “confetti arm” afterward; the dispersal is a physically violent act. Do you throw – I’m sorry, disperse – the confetti precisely at midnight? I give the signal, “go confetti” on my radio, at 20 seconds before midnight. Our first year, Peter Kohlmann said he wanted it to start the confetti early so that live feeds would capture the huge display right at midnight. Just getting the confetti out over the rails takes about a minute. The crowd noise at 11 p.m. is incredible, and then, when the confetti hits, it’s goosebumps time. It just takes over the senses. Within seconds, it becomes a literal blizzard. 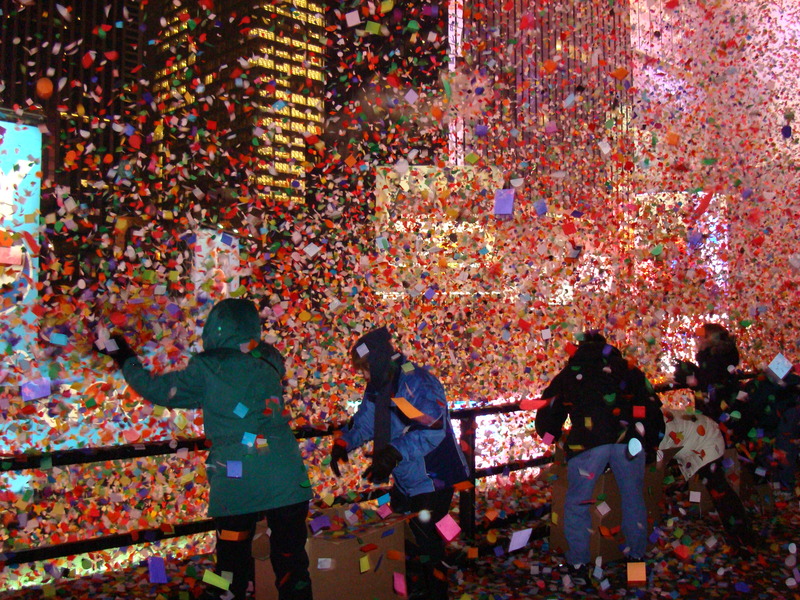 Below, the annual confetti “airworthiness” test in 2012. Meaning it reaches all corners of New York. If you go anywhere in Manhattan the next day, you’ll find confetti. Before the confetti comes down, though, it goes up and up. It stays in the air for about 30 minutes or longer, probably because of the vortex in Times Square, the air currents, and all the heat coming from the crowd. One year, I told the press that the confetti went upward because I soaked it in liquid helium first. I’m not invited to press things anymore. Crew size: The first year, we had about 50 or 60 people help us out. Then, last year, we hit a peak with 150. So this year, we reduced it to about 75 people. How do you prepare in the days leading up to that crucial moment, 20 seconds before midnight? We meet the trucks loaded with confetti in Times Square on Dec. 29 when they arrive at 9 a.m. and immediately bring the boxes to the eight different buildings that confetti will be dispersed from. We’re done by noon and always have lunch at the deli in the Edison Hotel. Then on the Dec. 30, I pass out everyone’s credentials, and sometimes colored ponchos, so the police can easily identify us on the day of. On Dec. 31, we get everybody together in one room and go over procedures and safety. I tell people, “This is bigger than any one of us in this room. But the reason it’s a tradition and the reason it’s spectacular is because of each and every one of you.” I also tell people that they’re the confetti police. If other people wander onto the setbacks and put something down on a ledge, we need to remove it, to protect our gig. And of course we’re not allowed to drink on the job. At the Times Square Visitor’s Center, you can write out a wish on a piece of confetti. On Dec. 31, each piece is collected and mixed in with the rest to be dispersed over the crowds. Why not use confetti launchers, which would take less physical effort? My right-hand guy, who has done this with me all 22 years, makes confetti launchers and cannons. We know about all the technology; there’s just nothing that can match our volume with the same effect. We use 2” x 2” squares of paper confetti, a specialized kind for the event, which would clog machines. Best part of your job: The most special year was 2000, when we did a countdown for each New Year’s around the world. We started at 6 a.m. on Dec. 31 and ended at 6 a.m. on Jan. 1. Most challenging part of your job: In the event business, you’re only as good as your last event. So if the confetti doesn’t fall on Tuesday night, I won’t be here next year. [Laughs.] Maybe they’d give me one more shot. Your plans for inclement weather: In the 22 years we’ve been doing this, we’ve never had snow. Knock on wood. Flurries and drizzle, maybe – but the confetti still happens. One year, the confetti was sticking to signs like decoupage; the next day, as it dried and unstuck, there were miniature confetti launches everywhere. Not drinking before you disperse the confetti sounds responsible. But you must at least celebrate afterward. We all go to O’Lunney’s Irish pub, where the food and Guinness flows. Do you get flak from environmentalists? I can’t imagine the cleanup crews the morning after are all too pleased, either. At a certain point, the guys down below ask us to stop because they want to start cleaning up the streets. Usually, by 3 a.m., they have it almost all cleaned. It’s amazing. Have your expenses increased much over the years? People think we make a fortune on this, but we don’t. When we started, having $1 million in liability insurance was considered adequate; now, it’s $5 million, and will probably be $10 million soon. Having an elevator operator to get to the setbacks can cost $1,000, and having a room for the crew to wait in costs $900. Even so, others in the events business must want in on the New Year’s Eve action. Several times over the years, people have tried to wrestle this away from us, because it’s such a high-profile event. The Times Square Alliance now has to bid it out, out of fairness, even though we were the ones who started it. After us, I’m not sure the confetti effect will continue the way we do it – by hand, that is. Dream job as a kid: I wanted to play in a band. But I was never good enough to get where I wanted to go. In music, you need a certain amount of talent to make it. Practice like it’s a performance. Even if you’re a cashier working at McDonald’s, don’t think, “Oh, this doesn’t matter.” Be the best at every job you do; then, when an opportunity comes along that you really want, those same patterns will follow through. Don’t be afraid to do things for free in the event business. You need to pay your dues, show up on time and get to know people. Working at Disney taught me to dedicate yourself to professionalism. Have respect for what you’re doing. Professionalism is a dying art. For other No Joe Schmos who are really into balloons, meet the Hot Air Balloon Pilot. This entry was posted in Best Of, Big shots, Cool jobs and tagged balloon art, confetti, new year's, new year's eve, times square by Megan Hess. Bookmark the permalink.